Americans spend about $40 billion annually to air condition their homes and offices - roughly a sixth of all electricity generated in the US alone. Yet, much of that money is being spent on conditioning buildings that fall short on modern energy efficiency standards. Air leakage and inadequate insulation are two of the most common causes for inefficient heating and cooling in American homes. Air leakage accounts for 15−25% of winter heat loss in the typical home. Meanwhile, research conducted by the Department of Energy revealed that heating and cooling makes up 48% of total energy use. Adequate and properly installed insulation works to inhibit the transfer of heat. In winter it prevents cold air from outdoors penetrating the inside of your house. Conversely, during summer, insulation helps trap cool, conditioned air inside the home while resisting the heat from outdoors. It is one of the most important features of any energy efficient home. A professionally installed roofing system from a trusted manufacturer can also help you significantly reduce your energy costs and make your home more comfortable. Some of today’s quality roofing systems have increased insulating values. Likewise, “cool” roofing options from manufacturers like Englert, Certainteed Solaris, Firestone, Decra and Classic Metal Roofing Systems can increase your heat deflection and save you even more money in energy costs. Moreover, there is no better time to have access to the attic in order to install proper levels of installation than during a roof replacement project when the space is already open for renovation. HowStuffWorks Home and Garden expert Stephanie Watson advises homeowners to look for roofing products that carry the government's ENERGY STAR label. According to the Department of Energy, a cool roof is one that has been designed to reflect more sunlight and absorb less heat than a standard roof. 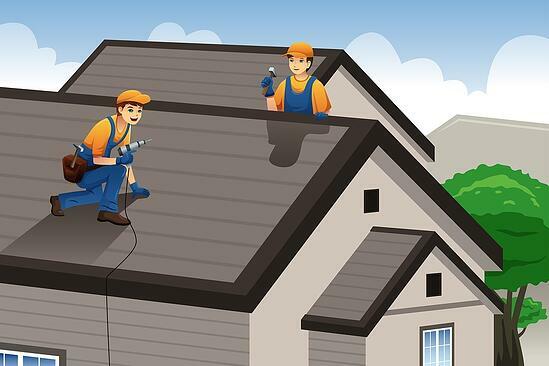 Cool roofs can be made of a highly reflective type of paint, a sheet covering, or highly reflective tiles or shingles. Nearly any type of building can benefit from a cool roof, but consider the climate and other factors before deciding to install one. US homeowners are being offered tax breaks to make energy efficient improvements to their homes — including roofing — with the IRS officially extending the non-business energy property credit through to December 31, 2016. The non-business energy property tax credit provides a 30% credit for installing qualified energy efficiency improvements to your home, and provides credits in various amounts for costs relating to residential energy property expenses. Labor costs for onsite preparation, assembly, or original installation are included as eligible expenses. Find out how to take advantage of the Tax Credit here. There is a stack of science out there about heat transfer and thermal exchange, but all you really need to know is this: in winter, heat escapes your home. And in summer, it tries to return. Insulation regulates the temperature of your home regardless of the weather, offering you and your family a comfortable living environment all year round. It does this by trapping the warm air inside your home. It also acts as a barrier to the cold air trying to enter. With correctly installed insulation, you will find your home less reliant on heaters and fireplaces to maintain warmth and comfort throughout winter. Rigid insulation: Typically packaged in boards or pip fittings and is typically used to insulate wall sheaths and foundations.